Keeping in mind I'm a huge fangirl of JT Ellison...you know how people say, "Man that so-and-so gets better with every book." Well in JT's case it's true. I LOVE LOVE LOVE her Taylor Jackson novels so approached this one with a bit of reserve but Taylor's BFF has always been one of my fave characters. Boy was I glad I did. 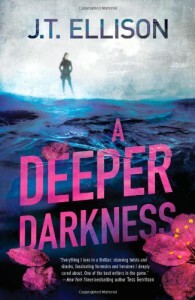 A Deeper Darkness is a stellar, yet heart-wrenching suspense novel (and yes I almost cried at the end).